Back to work today. As soon as Auntie Janet and I got up to the spinning room the noise made my head start to pound again. The first time I had to twist a broken thread, I didn’t want to go under the machine. It seemed alive. I didn’t want to be a piecer or a doffer girl. I wanted to run down the stairs and out the front door, over the bridge, up Mill Street, along the railway tracks and over the fence into the Edward Street garden where I could hide under a bush a make believe all day. But I am a mill girl, so I made myself go under the machine. The second time was not so hard. 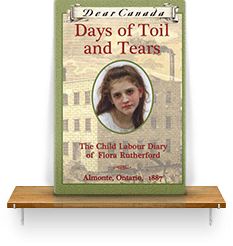 Flora Rutherford is delighted to finally have a proper family when her aunt and uncle rescue her from an orphanage and take her to live and work with them in Almonte, Ontario, but it is a harsh life, working in a textile mill. Will she find a true friend? What will she do when the inspectors come? My stepmother lived her final years in Almonte Ontario. When I visited her I would also wander around the town and one day I chanced upon the textile museum. In that museum is a set of beautifully made doll’s clothes, made by a young girl in the 19th century. I started to imagine that girl, a child with time to play with her dolls, and to compare her to the girls of her age who worked in the mill. When I started to imagine those worker girls I knew I had a story in the making. The great strength of this novel is not just the subtle illumination of working conditions, especially where children were involved, but also the beautifully rounded people she has created. The dialogue is sprightly and the on-so-skillfully interwoven details of 19th-century domestic and social life will fascinate readers. Along with all the character and colour author Ellis conjures, her character also describes the workings of the mill with exceptional clarity and folds contemporary issues into the story intelligently and succinctly. Here’s a lens sharply focused on period and place, an excellent addition to the series.